If you have been injured, learn your rights. Call our attorneys for a free legal consultation at 800-379-1244 or use our contact form. With 68,000 residents and thousands of college students and workers, car accidents are common in Framingham. Route 9, Route 30 and Route 135 are the major roads through Framingham, which transitioned from a town to a city in 2018. Neighboring communities include Southborough, Marlborough, Sherborn, Ashland, Natick, Wayland and Sudbury. The town has direct access to the Mass Pike and Interstate 495 can be accessed by Route 9 through Southborough. Car accidents in Framingham are investigated by Framingham Police or Massachusetts State Police, which have barracks at 470 Worcester Road along Route 9, near the headquarters of Massachusetts Emergency Management Agency (MEMA) bunker. According to the Massachusetts Department of Transportation, Framingham has 7 of the 200 most dangerous intersections in Massachusetts. These include the intersection of Route 30 and Edgell Road, Temple Street and Route 9, Cochituate Road near Whittier Street and Shoppers World Drive. Another vulnerable area is Framingham State University along Route 9. Students cannot safely cross Route 9 on foot to get to restaurant and shops. In December 2012, a 21-year-old student from Melrose was struck and killed by a car while trying to cross the busy road. As of 2017, the state Department of Transportation was in the early phases of designing a new intersection near Route 9 and Maynard Road to improve safety. Breakstone, White & Gluck is known for our results for car accident victims. One example is our $7.1 million award for a pedestrian who was hit by an MBTA bus. Another example is our $3.75 million settlement for a motorcyclist who was seriously injured by a negligent driver. Please read more about our work to see if we can help you with your case. Drivers do not always watch out for cyclists or give them enough room to turn at intersections. In Framingham, the good news is that some cyclists can now get off the street and use the Cochituate Rail Trail, which starts in Saxonville village and when complete, will end in Natick Center. Breakstone, White & Gluck has represented cyclists who have been injured by negligent drivers in Framingham. We hope you are never injured, but if you are, do not hesitate to contact us for a free legal consultation. We can answer your questions and help you determine your rights. In addition to representing cyclists who have been injured, Breakstone, White & Gluck has long worked to improve safety for cyclists, by supporting local bicycle clubs and through our Project KidSafe campaign. Since 2013, Breakstone, White & Gluck has donated over 15,000 bike helmets to children through our Project KidSafe campaign. 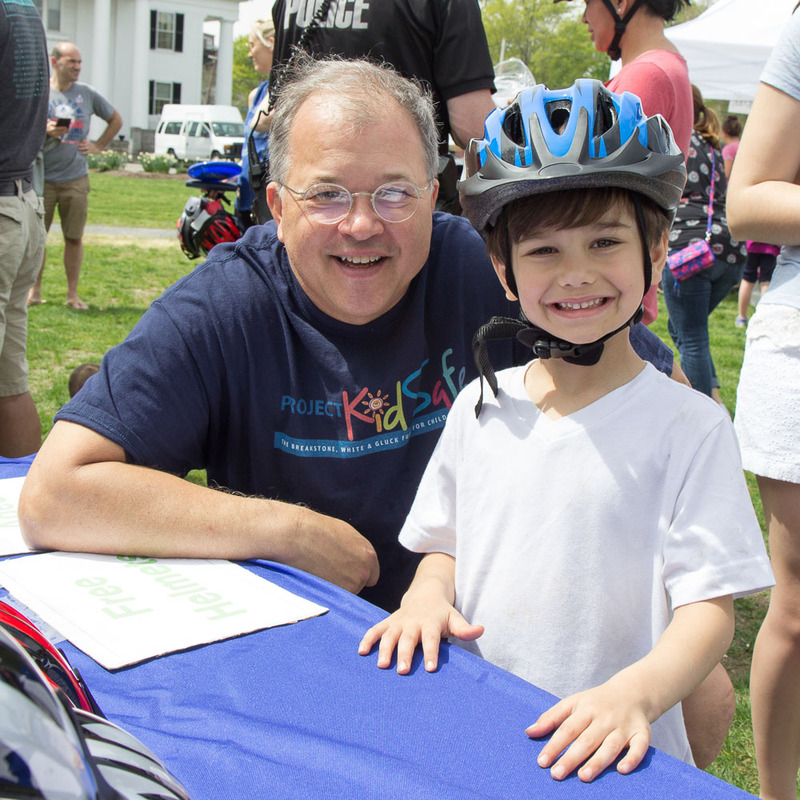 We are proud to partner with the Framingham Bicycle & Pedestrian Committee each year and donate helmets to children at the Framingham Earth Day Festival. Here are our photos and blog from Framingham Earth Day 2017. Framingham has a large number of construction-related companies, including roofing companies, window installation contractors and electricians. Construction accidents can happen when companies fail to follow safety protocols. In January 2017, one construction worker was trapped under a backhoe which lost control and slid twice down a snowy hill. The man was extricated and suffered serious injuries to his lower body in the accident. Nearby in Marlborough, a 30-year-old fell to his death while working at the New England Sports Center in May 2017. The sports center was in the middle of a 88,830-square-foot expansion project, which will add two ice skating rinks and more parking. In August 2017, another worker fell 15-18 feet at Natick-based Mathworks. He fell when a stairway collapsed and suffered arm and head injuries, according to a MetroWest Daily News article. Our attorneys are experienced in handling all types of injury cases, including car accidents, pedestrian accidents, truck accidents, premises liability cases, construction accidents, dog bites and wrongful death cases. If you or a loved one has been injured, contact our attorneys for a free legal consultation at 800-379-1244, 617-723-7676 or use our contact form.